Accused's statements ruled inadmissible - Patrick C. Fagan, Q.C. A judge has ruled two of three incriminating statements, made to Lethbridge police officers hours after a fatal vehicle collision in August 1993, will not be admissible in the re-trial of the accused. Mr. Justice Art Lutz of Calgary ruled Wednesday the two statements, given to Const. Darcy James hours after a collision in north Lethbridge killed a pregnant Lethbridge woman early Aug. 28, 1993, were made in violation of the accused’s rights. However, a statement by the accused to Const. Bill Basso will be admitted. All statements relate to whether the accused was driving at the time of the accident, a key defence claim. Wednesday marked day eight of the scheduled 10-day trial. The accused is charged with criminal negligence causing death and injury, impaired driving causing death and injury and driving with an illegal blood-alcohol level. He was convicted in May 1995 of impaired driving causing death and sentenced to four years in jail. The accused has contended he was not driving the vehicle which slammed into a second, killing Patricia Rose Goldade, 28. Lutz said statements Basso obtained from the accused shortly after the fatal crash were part of the “routine investigation” of the incident and therefore admissible. The accused told Basso someone else was at the wheel and that both men were sober at the time of the collision. He later said they were at a friend’s place drinking a hot rum-Buckley’s combination and became intoxicated. Lutz cited cases as precedence in determining the inadmissibility of two statements made to James. Lutz agreed the accused made statements to James, now a city police sergeant, although he had not been arrested under the charges from which the admissions had come and he questioned whether the accused had been read his rights. He also questioned how freely and voluntarily the accused made his incriminating comments. He said James’ anger while driving the accused from hospital to the police station may have unfairly elicited an incriminating comment from the accused. James said she was merely talking about outstanding warrants. She testified the accused told her he hadn’t touched a drop of alcohol in eight years and James reminded him of the outstanding Fort Macleod warrants, a court date scheduled for the following Monday on similar charges and the most recent fatal incident. “(Name withheld), I don’t want to hear anymore stories. 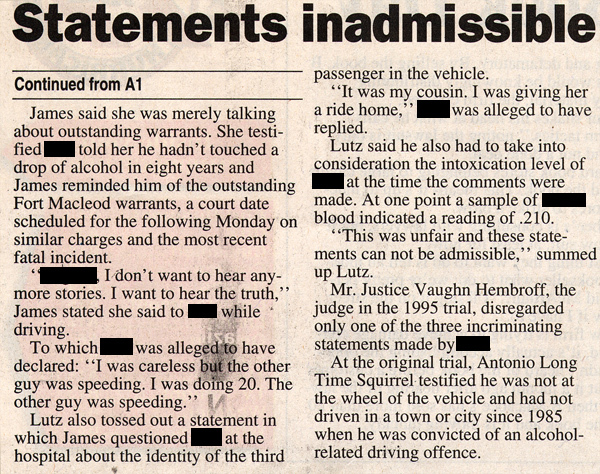 I want to hear the truth,” James stated she said to the accused while driving. Lutz also tossed out a statement in which James questioned the accused at the hospital about the identity of the third passenger in the vehicle. “It was my cousin. I was giving her a ride home,” the accused was alleged to have replied. Lutz said he also had to take into consideration the intoxication level of the accused at the time the comments were made. At one point a sample of the accused’s blood indicated a reading of .210. “This was unfair and these statements can not be admissible,” summed up Lutz. Mr. Justice Vaughn Hembroff, the judge in the 1995 trial, disregarded only one of the three incriminating statements made by the accused. At the original trial, Antonio Long Time Squirrel testified he was not at the wheel of the vehicle and had not driven in a town or city since 1985 when he was convicted of an alcohol¬related driving offence.